ChargePoint charging stations provide the electricity that electric cars need to recharge car batteries... As people start to use more electric cars, we will be ready to provide the energy you need using our renewable energy technologies by relying mainly on a combination of Solar & Wind. Networked Charging Stations, manufactured by Coulomb Technologies, are at the present time the most advanced, feature-rich charging stations available in the world. ChargePoint charging stations provide the electricity that electric cars need to recharge car batteries. This unique EV Island package includes a ChargePoint CT2100 EV Charger 120v and 240v Dual Port “Smartlet,” along with an Energy Ball® V100 or V200 wind turbine and/or solar PV panels. All ChargePoint charging stations use industry standard network and application protocols. 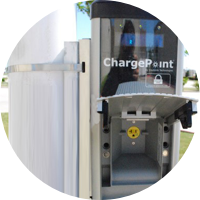 The ChargePoint stations can provide customized reports and come with complete reporting and management systems that can be easily customized to fit your needs. Contact Us today for more information about this unique technology.